AMM blog: Wellness and my favorite tea for flu season or any season! Wellness and my favorite tea for flu season or any season! I've made it a personal goal to share more about wellness on the blog and social media as it has become more and more of a topic of interest in my own life! This Winter I've spent an obscene amount of time fighting off illness, more days sick than healthy and I'm really not ok with it. Being sick makes you appreciate the times that you're well but also can cause a person to rethink their lifestyle and what sort of contributing factors are causing sickness. 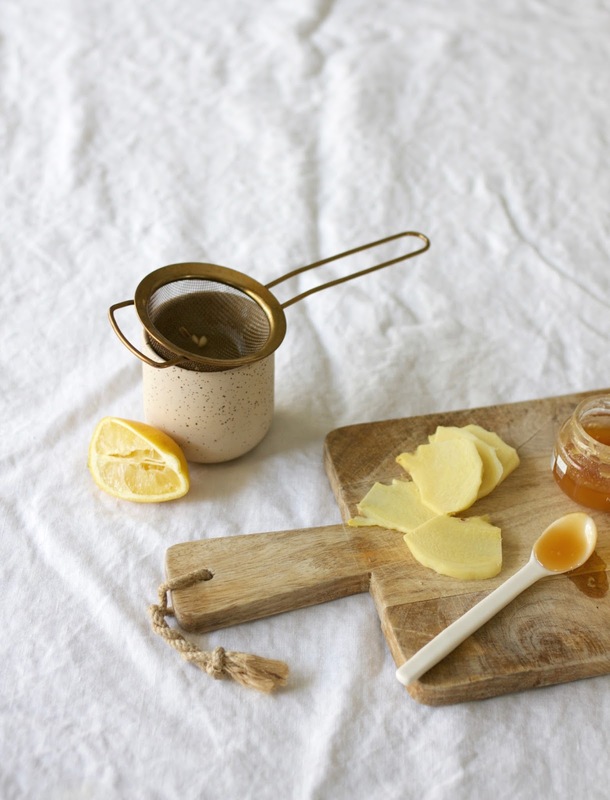 While this recipe is by no means revolutionary, I thought I'd still begin by sharing something that is my go-to when filling under the weather, especially is a sore throat is one of the symptoms. Peel ginger with the side of a spoon, chop it up into chunks and pour steaming-hot water over the top. I try to let it steep for about 10 mins to allow enough ginger to melt into the water. The I squeeze half a lemon through a sieve (find the gold ones here) to catch seeds, over the top and a teaspoon of raw honey, maybe a little more. Not only is is warm and soothing to a sore throat but ginger helps with nausea and pain. Lemon aids in hydration, adds Vitamin C and is a powerful antibacterial while the honey soothes a cough and helps you sleep.